These small, low-power wireless transmitters broadcast radio signals at regular intervals that can be heard and interpreted by iOS and Android devices equipped with Meridian-powered mobile apps from Aruba and our Meridian Engage app development partners. Aruba APs with built-in Aruba Beacons allow you to remotely manage our 4-year battery-powered standalone Beacons. Not currently running an Aruba wireless network? No problem. The Aruba Mobile Engagement solution works on non-Aruba networks. 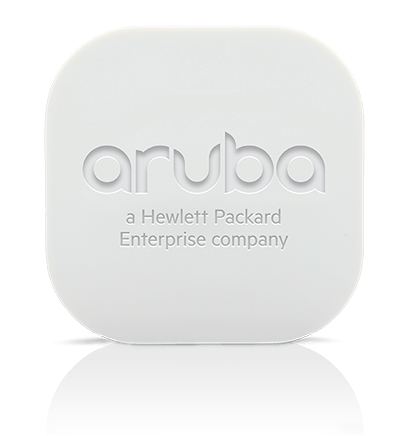 Aruba Beacons do not require smartphones to connect or pair with them and do not collect mobile device identity. BLE technology offers the most accurate positioning so you can deliver a rich, relevant mobile engagement experience. The Aruba Beacons mobile app lets you install beacons, place them on a digital map and configure accuracy on the fly. Aruba Beacon signals can be read from as far away as 200 feet, and proximity can be detected down to a few inches away. Aruba Beacons operate on the same type of radio waves as 2.4-GHz Wi-Fi routers. As a result, the signal can be diffracted, interfered or absorbed by materials in the space such as metal, wood or water. Charges from an Aruba access point USB port or any powered USB slot on TVs, computers, wall plugs and other devices. These beacons install into existing Aruba access points via USB ports for data connectivity. New smartphones and tablets with a dual-mode Bluetooth 4.0 chip running the latest version of the Android OS are Bluetooth Smart Ready. Android-powered Bluetooth Smart Ready devices running the latest OS will be compatible with virtually any Bluetooth enabled product, including Aruba Beacons. BLE must be turned on to work on any BLE-enabled device.